Hang the Dogs will probably be the definitive history of the Balangiga Massacre… comprehensive and informative.. Couttie has provided a huge amount of information and a large number of valuable insights into the conditions that produced the Balangiga incident, the thoughts and assumptions by many involved Americans (and some Filipinos) about U.S. policy, the Philippines and the war that led up to it, and a century’s worth of consequences, intended and not, that followed. His achievement is not likely to be surpassed. John M. Gates, Author, Schoolbooks and Krags. 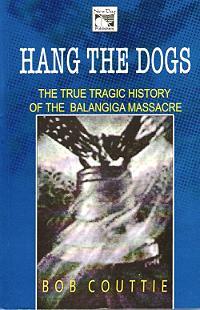 I have read other publications regarding the Balangiga massacre, but the most reputable is written by Bob Couttie, “Hang the Dogs: The True Tragic History of the Balangiga Massacre,” with very insightful material that will greatly contribute to our present counterinsurgency campaign. In Hang the Dogs, Bob Couttie presents a number of provocative ideas worthy of consideration… In Couttie’s view, there are many more heroes than villains on both sides…Hang the Dogs does contain some vivid descriptions that both engage the reader and bring events to life. Bob Couttie clearly has the requisite skill and knowledge to write a first-rate historical novel should he choose to attempt it. The result would be a gripping tale of intrigue, suspense, and violence.